september | 2014 | The Lifestyle Factory. Products are talking or giving signs to us, but why? That’s because we want to have devices that are smarter, easier and more practical. In a world where everybody is busy, we sometimes forget, to re-stock things for example, and that’s why the technical term the ‘Internet Of Things’ is growing so fast. As consumer you have a lot of power. By pressing one button on your smartphone, tablet or computer, you have access to a complete new world. You don’t have to worry anymore, because the technology nowadays makes it so easy for us. Contemporary everything connects with the Internet, and it looks like the Internet is the new caring. We share and get the information and services through Internet and get care in return. The word ‘Inline’ is a result of this and is getting more popular and important in our lives. A good example of the technical term ‘Internet Of Things’ is the intelligent Clever Medkit. The Clever Medkit is a smart First Aid kit that makes suggestions for you and knows what is missing. It reminds you when it needs to be restocked. It also tells you how to use its supplies in case of an injury or any other medical emergency. The Clever Medkit is equipped with a series of buttons and LED lighting. Clever Medkit gives you the information and lights up when you want to know what particular items you have to choose in an emergency. But it also lights up when the Medkit is out of particular items. It has a built-in camera to see who’s accessing the first-aid kit, to help discourage people from wasting or stealing supplies. The kit connects to the Internet, so you can access it anytime, anywhere. You easily can check its stock from afar and order supplies to re-stock it. 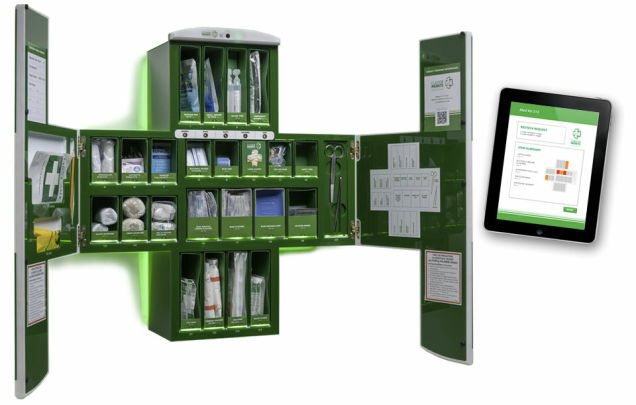 The Clever Medkit is cool, because it gives us the information you want and makes it easier for us to re-stock it anytime, anywhere you want. It continuously monitors inventory levels and tracks use, helping you to protect you and promote safety and health in your environment. With the Clever Medkit your First Aid kit is no longer annoying and messy. This is why it will improve the quality of life of people that use the Clever Medkit. With this product you really see the technical term ‘Internet of Things’ is growing fast. Internet of Things is becoming more important and that’s why it has future growth potential and why it’s new and innovative. Nowadays, we are all part of the technical term empowered patient. We want to have 24/7 care and want to be informed about everything before visiting a medical professional. We are getting more aware and see the importance of our health. But we also want to know things faster, easier and better. With the non-stop renewing technology we are able to get a better vision of our health, but we also want to improve this. We want to measure our health constantly; this is called the ‘Quantified Self’. As we see, DIY Diagnoses are getting more popular. These are simple to use technologies that offer a good enough level of diagnoses about symptoms, helping people determine if they need to seek further medical care. Something unique is developed that contributes to the future of health… it’s your doctor’s new best friend, called the Scanadu Scout. 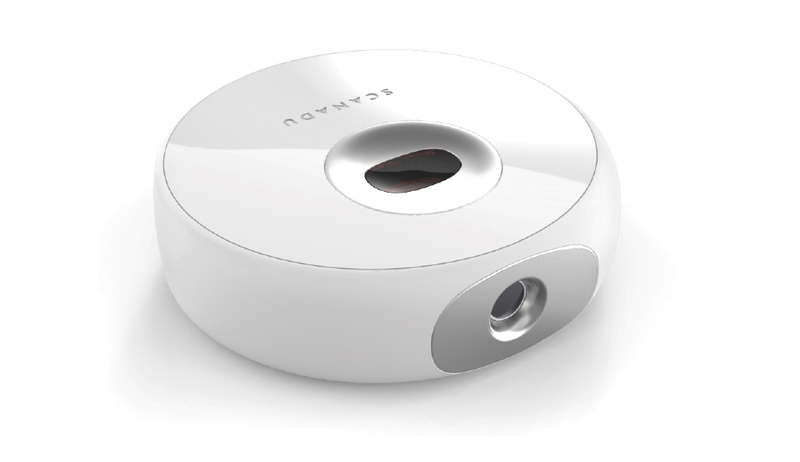 The Scanadu Scout is a scanner designed by Yves Behar, packed with sensors which enables anyone to capture important physiological data in a snap, by using your smartphone and Bluetooth. It measures and tracks your health in an easy way, as easily as checking your email. With the Scanadu you see symptoms before they arrive. You can easily check your skin and core body temperature, blood pressure, heart rate, oxymetry, respiratory rate, ECG and your emotional stress level and in the future probably even more, now you know yourself even better. While connected from home, you can share information with doctors or others if you want to. The only thing you have to do is simply place the Scanadu to the forehead for ten seconds. In a snap your stats will be displayed on your smartphone. The Scanadu Scout provides a new and connected experience. It’s so simple to provide valuable data about your body with the Scanadu, just by placing it on your forehead. Words from the Designer Yves Behar: ‘’The simplification of healthcare starts with a simple object.’’ And this is exactly what makes it so cool, because of the simple and practical part of the Scanadu. Another reason is that the Scanadu reflects the future of health, because nowadays we want to be more informed. And the Scanadu helps us with that. It’s innovative and has future growth potential because the concept of Scanadu is really strong. 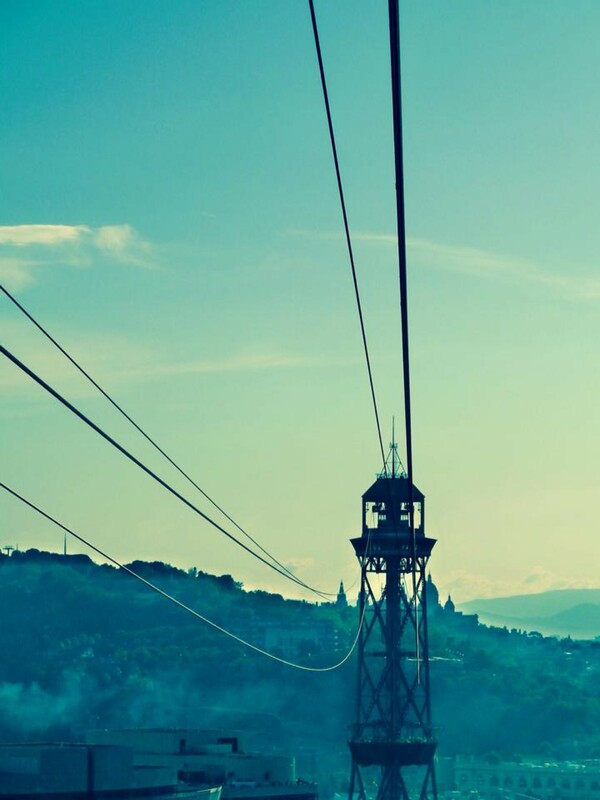 They have paid attention to the future, a future where you can imagine and know yourself best. From now on, the information of our body is not locked away inside the walls of a hospital, but is in our hands where it belongs. With the Scanadu you have an emergency room in your pocket and you can share countless personal details with relevant people. Take health conversations and discoveries to a new level. You can easily see the different aspects such as different locations, activities and foods that affects your body by using the Scanadu. Now you can discover connections, watch trends, catch changes early and track them. The Scanadu makes us understanding our body better and more personalized advice can be given and received. This enables us to handle our health better and helps with improving the quality of life. With the Scanadu, we are the last generation to know so little about our health. Imagine all the other possibilities with the Scanadu Scout in the future. Book: Serious Trendwatching Part 2 – 25 of the best Coolhunts published by Fontys Academy for Creative Industries and science of the time. Everybody needs it… water! Our body consists of about 50 to 75 percent of water. Water is an amazing thing. Yet it’s the unsung hero of beverages. But the big question is, do we drink enough to keep our body hydrated? Sometimes it’s really difficult to stay hydrated. Every body knows that you have to drink a minimum of 2 liters water a day. Hydration of your body is necessarily for your health and for energy for your daily routines. Water helps to power the moments in your life. But in most cases we actually don’t think about what we drink daily. One of the most important reasons is because we are so busy with everything. Now ‘The Drink Up Campaign’ in America has a magical solution to drink more water more often and stay hydrated. They hired an expert, ‘The Talking Water Fountain’. The Talking Water Fountain for sure makes a sensational experience for those who use this magical fountain. When the unsuspecting drinkers put their lips to the water, something marvelous happens. The Talking Water Fountain looks like a normal water fountain, but it’s designed with a new technology. 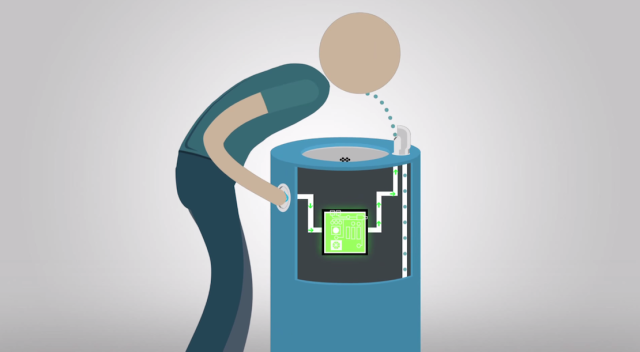 When your lips touch the water it completes a circuit and triggers a play-recorded audio. Every time you move your lips away from the water, the audio stops immediately. The Drink Up Fountain is powered by Partnership for a Healthier America, the private sector, PHA Honorary Chair First Lady Michelle Obama, Y&R New York and sister digital marketing/ad agency VML New York to boost healthy hydration. The fountain certainly helps to attract people to drink enough water and increase a better health and more energy. With the monologue-giving public drinking fountains the Drink Up Campaign also hopes to inspire and surprise a lot of people. The Drink Up Campaign wants to spread the water fast and they have a strong, recognizable and inspirational quote to keep spreading this: ‘Drink up! You are what you drink – and when you drink water, you drink up.’. A lot of supporters and famous people are promoting the Drink Up Campaign to spread the water, like John Legend for example. If we look for what’s so cool about the Drink Up Water fountain, we look at the following things such as: What makes it new? What makes it innovative? Does it have future growth potential? And how does it improve the quality of life? Till now people are very positive and surprised about the fountains. The Drink Up Fountain inspires people with the endearing monologues, but also makes them laugh. We can say, that the rising technical term ‘Gamification’ is becoming more and more important in our lives. For years some people thought drinking water is boring. Now, with this new high-tech fountain, thanks to Drink up, water is getting its chance in the spotlight. The Drink Up Fountain may look like a regular fountain, it sure doesn’t sound like one. It employs voice technology to literally spread the word of good health, encouraging people to stay hydrated. This kind of latest health technology is creating a moment of magic and people really find it magical. This is what makes it so cool, because you are not expecting anything magical to happen while you are drinking from this fountain. Another reason why it’s cool, is because one of the easiest and most important ways to be healthy is in front of you… water! And the Water Fountain keeps you hydrated in a fun way. People also feel more connected through the use of the monologue-giving public drinking fountains from Drink Up. Many people are curious when they see other people laughing at an talking water fountain and sharing there experiences with the fountain on social media or with there friends or family. And you know what they say… Sharing = Caring. So if people are sharing their experiences with others, they are showing us that they care about their health, but also about sharing the moment with others. And in fact, sharing with a virtual buddy, the Talking Water Fountain. In a sort of unbalanced world where we are always busy, the Talking Water Fountain gives a moment of pleasure and rest. It makes it easier to make a healthy choice, but also more accessible and more affordable for all kind of people. So when people drink enough water, they experience an overall higher level of health and you can focus better on other things. This is why it has future growth potential and helps improving the quality of life, because the more busy we are, the more we want to escape from a busy world and want things to laugh and rest such as the Drink Up Water Fountain. The water drinking fountain encourages to make the healthy choice the easy choice. But also staying hydrated offers a laundry list of other health benefits as well, including helping weight loss and healthy weight maintenance, facilitating muscle recovery after exercise, and nourishing cells in the body that needs repair and growth.